We face opportunities and challenges everyday. Taking advantage of the opportunities or managing the challenges involves change and maybe moving workers out of their comfort zone. Each challenge or opportunity requires different management and change level. The following is a spectrum of change levels that will cover almost every challenge faced in business. Improve efficiency by determining if workers are putting the right effort at the right place. Take a look at the current work practices and if the workers are doing what they are suppose to do. Worker competence and willingness to work are two major factors at this level. Superstars in box 1 are those who are competent and willing to work. They are go-getters who you only need to describe the job for them and they will execute it flawlessly. Workers in box 2 are good workers who are willing to work, but not competent enough to execute a faultless job. Training and development are the solution to increase the workers’ efficiency in this box. Competent and experienced workers in box 3 are unwilling to do their jobs for different reasons. Motivation may help improve the efficiency in box 3 but the workers are choosing not to work for different reasons. Workers in box three knows the rules and regulations, knows the lube holes, shortcuts and exceptions. Troublemakers are usually found in this box and the leader or manager should be careful with them. Workers in box 4 are either new workers or older workers who’ve been moved to a new job without proper training. Their unwillingness to work may be affected by their incompetence or the neglect they feel after they have been assigned to their new role. The leader should either replace workers in the box or train and motivate them to do their jobs. Executing the right business process. 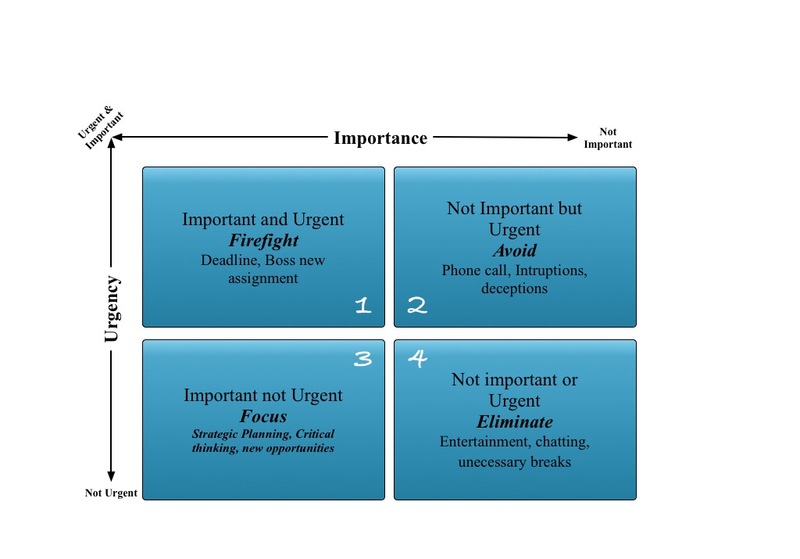 Focus on the important and not urgent part of the business before they become important and urgent. 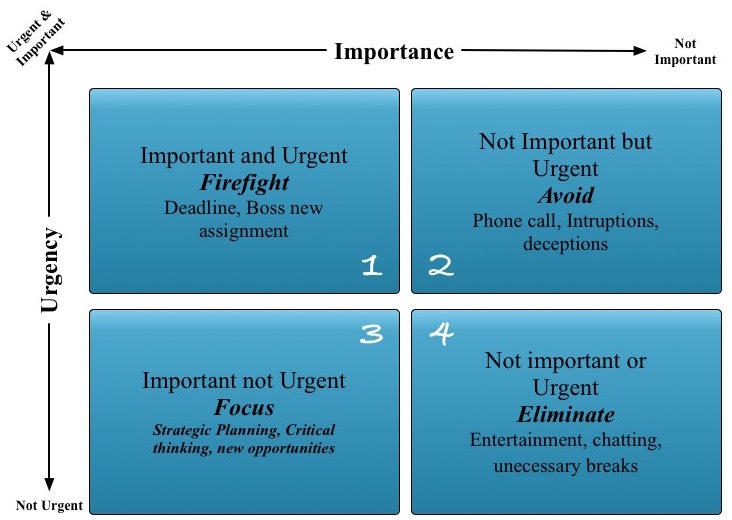 Important and urgent businesses are usually executed in a firefighting mood which lead to mistakes or substandard jobs. Organize work by using the right procedures and setting priorities with key performance indicators and milestones. Pareto Principle states that 80 percent of all the things being done are executed by 20 percent of the right effort by the right people. Assign the right workers with the right resources to high yielding part of the business. Level 3: Improve, eliminate and copy. 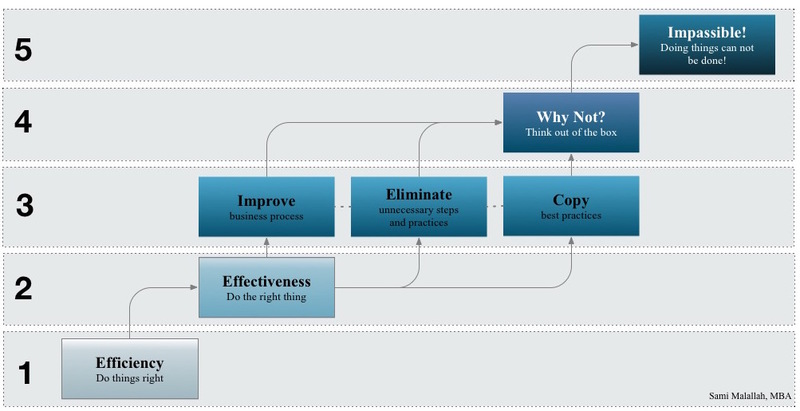 Cut or improve some of the steps from the best process recognized for the business. In level 2 we selected to automate processes to conduct the organizational business, but we need to improve or trim some of the redundant steps that take up time and recourses with little or no positive effect. Redesign the business process by eliminating the unnecessary steps, improve vital steps and imbed best practices in the process. Revisit the business process with fresh and unbiased eyes. Some of the steps in the process were put to inflate somebody’s ego. Other steps were useful for many years, but became absolute now. Some activities and regulations are practiced in the organization for no apparent reason. When asked, the workers will say “we always do it this way, but we are not sure why!” Simple questions can reveal a lot of wrong practice. The same simple questions can be directed to top management and floor workers. Organization’s do not work soon. Competitors with similar products are produced by similar processes or even better. The organization should explore how others are executing their businesses and find ways and means to adapt them in the organization. Change will always have resistance from workers living in their comfort zone. Not Invented Here (NIH) is one of the hurdles that workers used to stop or even sabotage processes or practices they did not develop internally in the organization. Workers ego and selfishness will find faults and difficulties in the new best practices they did not develop. Resistance can be handled by explaining or demonstrating the benefits of the new best practice and how it may help the workers in their daily work. Level 4: Think out of the box. Brainstorm new idea nobody thought could be possible or feasible. The new ideas may have a slim chance to succeed, but experimenting with these ideas after careful thought may yield great results. The new ideas may lead to other possibilities worth further exploring. Integration between different tools or technologies can result in different possibilities and products. New ideas are always welcome, but implementing them will face Great resistance. Change management is a major factor in getting the new ideas go through the comfort zone. Complete shift in the thinking paradigm. In this level the business owner was exploring new territories that never been explored before. The breakthrough might be in changing the future direction by more than 90 degrees. Intel dropped the memory chip business and pursued the processor business. Steve Job reduced the Apple products from 12 to only fore after his legendary return to Apple.